Day 59: Sports nutrition and supplements. Do you need them? It is time to talk about one of the most controversial topic, but we have already told you that your physique is a reflection of nothing else than your lifestyle, so let's make it clear. 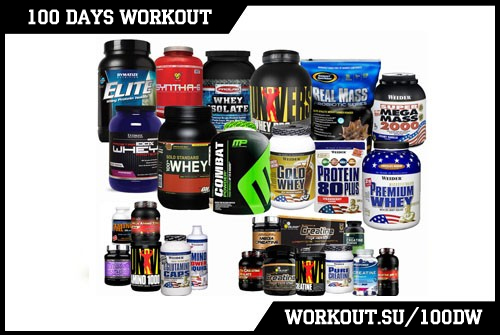 Today we will share with you our thoughts about sports nutrition and supplements and we will try to explain why people do not need to use it unless they are professional athletes or they are making money in fitness industry. Another exeption we are not going to talk about is if you take supplements because your doctor prescribed so. The idea of this post is to look on the sports nutrition industry from a different angle, because WorkOut is proposed as an accessible, effective and free alternative to the fitness clubs. That is why when we discuss sports nutrition topic we are going to defend the position that you can achieve great results without it! This post will be about the supplements that are often advertised on the Internet or in glossy magazines as a means to look better. The most popular are protein shakes, gainers and fat burners. As far as we are concerned these three the industry makes the largest profit. We will not look into how supplements can reflect on your health in the long term. This question is hardly researched at the time therefore we cannot draw any conclusions on that. As well we cannot trust the information provided by the makers of supplements since its reputation is undermined by bad science or even by clearly misleading so called 'research'. For instance, the tobacco industry in the 1950-s funded research that was poised to prove that smoking has positive effects on your health. The link between lung cancer and smoking was not yet established then. That is why we are so sceptical on supplements but we cannot stop you from using them and everyone has to decide fom themselves. What we want to tell you that the advertised supplements cannot solve your issues and to make it clearer we advise you to look again into our post on calorie balance. Let's assume there is a hypothetical aspiring newbie who wants to gain mass but he always comes short of his goal although he is training twice a day and eats like an IFBB bodybuilder (at least he says so!). Honestly, that is seen quite often among young guys. We know that there is no miracle and there are not enough calories to build mass. Either he trains too much or he eats not enough. But he hardly understands and thinks that he achieved his genetic limits and starts to think that sports nutrition might help him out since it promises to solve his issue in shortest time possible. Eventually he gives up and buys protein or, what is even worse, gainer. What does he profit from that? His energy balance finally shifts into calorie proficit and he starts gaining mass. That is a success but it is not as clear as it seems. The results he has gained will stay as long as he takes in the sports nutrition! If you are doubtful about taking in sports nutrition then I recommend to read the phrase about once again. While the positive caloric balance is sustained only with taking in additional supplements then after he drops it he will return to the results prior to the moment when he started on the supplements. That is inevitable as the sun going up in the east. If you know stories when this is not true then look into the other factors. Our hypothetical newbie has little choice, either he gets hooked on sports proteins while he wants to look better or he falls back to where he started after he stops taking in additional supplements. The industry will be happy if he makes the first choice! Our hypothetical newbie does not have a clue about proper nutrition, what constitutes different types of food, how many calories are in there and so on. It does not matter how hard you train, without proper nutrition you are hardly, or probably never, able to achieve any reasonable results. That is why our hypothetical newbie after weeks, months or years of training can come to a conclusion that it is all pointless and leaves his attempt to reach his goal. That is often seen in fitness club visitors who may train for months without any visible return. They have not done any effort to understand how their bodies work and being frustrated with the lack of results they drop off from training and clubs. We can understand why professional athletes take in supplements since their results are directly linked with their income. This is the peculiarity of their trade, a rule of the game they have to play to if they want to do what they love and get paid for this. But even they cannot achieve what you see on photoes and on the internet. To make a really successful shot hunderds of shots are made and the best one is later brushed up on the computer. That is the nature of fitness industry to sell you a picture that does not even exist. These are the words of Gregg Plitt, fitness model #1 in the world, 125 front pages for the last 4 years and he knows what he is talking about. If you want to dedicate your effort to improve youself then I am asking you to think it over if you really need any supplements. Are you trying to solve a quick solution to a long-standing problem? I do not want to disappoint you but there are no quick solutions and that means if you want results then you have to change your lifestyle. Can you achieve great results without any supplements, only with training and proper diet? Indeed you can. I know a great number of real life guys who succeeded in that. Was it hard? It was! If you want to look better, if you want to be stronger then you have to spend more time training and take care of your diet. At least workout allows to make it versatile and not boring. I want to emphasise that in the former Soviet Union countries controls over sports nutrition and supplements are quite laxed and there is no guarantee that the inside concur with the outside.